Ash is having some serious car trouble. Another Raimi has returned! 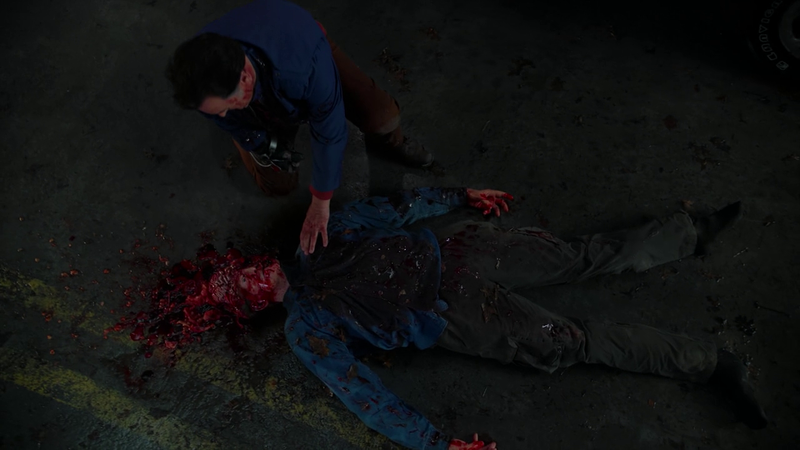 Although Evil Dead franchise creator Sam Raimi has yet to write or direct an episode in the second season of this TV series that continues on from the original Evil Dead trilogy, his brother Ted Raimi - who had a part in all three Evil Dead movies - joined the cast of the show in the previous episode, 'Last Call', as Chet Kaminski, the childhood friend of our demon-hunting hero Ash Williams (Bruce Campbell). Now Sam and Ted's brother Ivan Raimi, with whom Sam wrote the third Evil Dead movie (Army of Darkness) and the pilot episode of Ash vs. 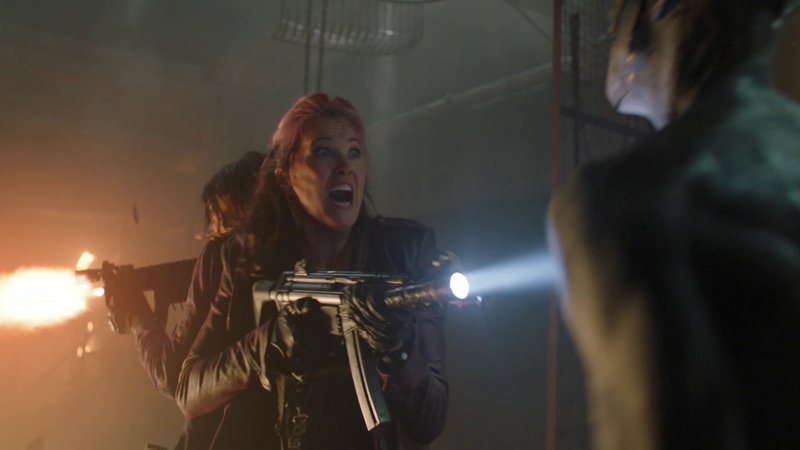 Evil Dead, has come back to the series to earn a solo writing credit on this episode. Also returning for 'DUI' is director Michael J. Bassett, who was given the honor of being the first director other than Sam Raimi to direct chapters in the saga of Ash Williams when he took the helm of the second and third episodes of season one. Now he's back for the fourth episode of season two. 'Last Call' ended on a devastating note for both Ash and we the viewers, as his beloved Oldsmobile, now possessed by the forces of evil, ran down his father Brock. Brock was played by Lee Majors, who was delivering an incredible and highly entertaining performance in the role. I had high hopes for Brock's future on this show, hopes that were dashed on the ground much like Brock's brains were. As sad as it is to lose Brock, it's equally as amusing that the corpse Ash mourns over is such an obvious dummy. It's all part of this show's charm. 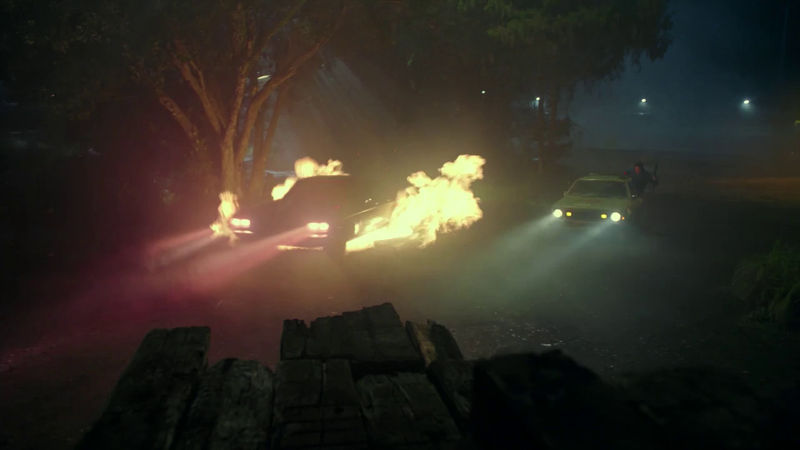 Ash's determination to catch up with his car and drive the evil out of it is made even stronger when his sidekick Pablo (Ray Santiago) ends up trapped in the possessed vehicle with Lacey Emery (Pepi Sonuga), the daughter of Ash's high school sweetheart and one of a group of teens who stole the Olds - before it got possessed and killed them all. With Chet by his side and classic rock on the soundtrack, Ash pursues his car through the streets of his hometown, headed toward the place where the Oldsmobile first came into his life. The demolition derby on the outskirts of town, where Brock brought the car. 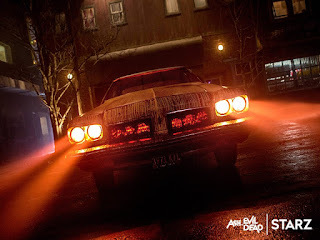 Yes, we have now learned the origin story of this vehicle that Ash has owned ever since we first met him at the beginning of the first Evil Dead movie. The chase and battle with the Olds takes up most of 'DUI', but Pablo and Ash's other companions - Dana DeLorenzo as Kelly and Lucy Lawless as Ruby - also get their own subplots. Pablo has been getting tormented by the Book of the Dead ever since having a traumatic experience with it at the end of season one, and that storyline takes some steps forward here. Meanwhile, Kelly and Ruby are off on their own side adventure, battling the demons Ruby brought into the world at the end of season one in hopes of stopping them before they can summon an ever greater demon. Their mission adds some extra action into an already action-packed episode, as they blast and slash their way through the demon horde. And these demons are easier to wipe out than I expected, I thought they'd last much further into the season than episode four. But I also thought the same thing about Brock. This show keeps surprising me. 'DUI' was a solid episode. I don't like losing Brock and I don't like what's going on with Pablo, but I don't think we're supposed to. These are purposely downer elements in an otherwise addictively feel-good show that consistently delivers a half hour of fun with every episode.